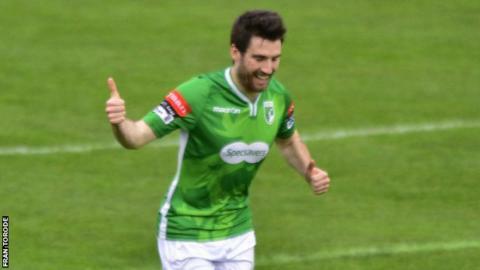 Guernsey FC continued their fine form in Isthmian League Division One South as they eased to a 6-2 win over Tooting and Mitcham United at Footes Lane. Ross Allen opened the scoring with a 20th minute penalty before Craig Young doubled the lead nine minutes later. Jake Baxter got one back for the visitors before Allen added a second spot kick and Sam Cochrane headed in a fourth before half time. Matt Loaring got a fifth soon after the break before Allen got his third. Baxter got a consolation late on as the visitors were awarded the third penalty of the day, and the striker calmly beat substitute goalkeeper Jakub Machlowski.